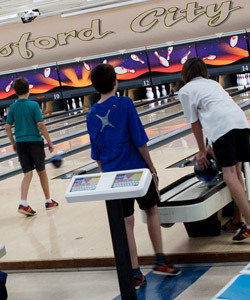 Our junior leagues at Gosford City Bowl cater for children of all ages and abilities. Whether they be bumper bowlers, new to the sport or experienced bowlers, there is a junior league that will accommodate them. Bumper Leagues are for smaller children that are new to the sport and don’t know how to bowl yet. Gutter stoppers, called bumpers, are placed in the gutters so the ball does not fall in. This results in more pins being hit and more fun for the little ones. Not only do the bumper leagues teach the children how to bowl, but they introduce them to competition bowling and help them interact with other children.